Najafov, T. (2015). Generalized concept of $J$-basis. Sahand Communications in Mathematical Analysis, 02(2), 45-59. Tofig Najafov. "Generalized concept of $J$-basis". 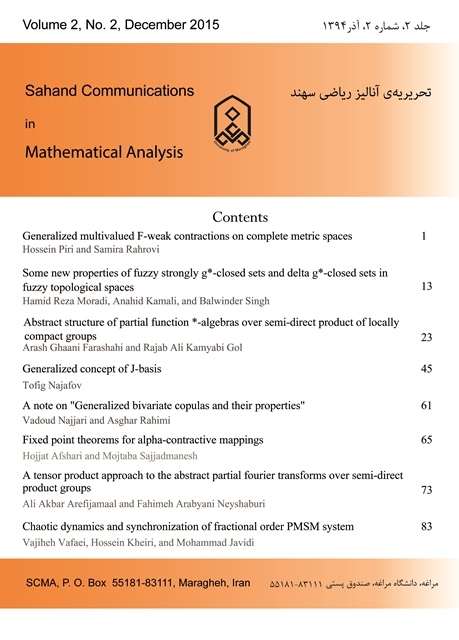 Sahand Communications in Mathematical Analysis, 02, 2, 2015, 45-59. Najafov, T. (2015). 'Generalized concept of $J$-basis', Sahand Communications in Mathematical Analysis, 02(2), pp. 45-59. Najafov, T. Generalized concept of $J$-basis. Sahand Communications in Mathematical Analysis, 2015; 02(2): 45-59. Nakhchivan State University, University campus, AZ7012 Nakhchivan, Azerbaijan. A generalization of Schauder basis associated with the concept of generalized analytic functions is introduced. Corresponding concepts of density, completeness, biorthogonality and basicity are defined. Also, corresponding concept of the space of coefficients is introduced. Under certain conditions for the corresponding operators, some properties of the space of coefficients and basicity criterion are considered. L. Bers, Theory of pseudo-analytic functions, Lecture Notes, New York University, 1953.
erential equations, Lectures in Applied Mathematics III. Interscience Publishers, New York, 1964. B.T. Bilalov, Bases and tensor product, Trans. of NAS of Az., XXV(4) (2005), 15-20. A.V. Bitsadze, Boundary value problems for second order elliptic equations, Moscow, Nauka, 1966, 204 p.
 O. Christensen, An introduction to frames and Riesz bases, Springer, 2002. A. Douglis, A function theoretical approach to elliptic systems of equations in two variables, Comm. Pure Math., VI (1953) 259-289. H.G. Feichtinger and K.H. Grochenig, Banach spaces related to integrable group representations and their atomic decompositions, Part II. Monatshefte fur Mathematik, 108(2-3) (1989), 129-148. S.A. Gabov and A.G. Sveshnikov, Linear problems of the theory of nonstationary internal waves, M., Nauka, 1990. K.H. Grochenig, Describing functions: atomic decompositions versus frames, Monatshefte fur Mathematik, 112(1) (1991), 1-42. Ch. Heil, A Basis Theory Primer, Springer, 2011.
. Equat., 3(10) (1978), 949-977. Yu.D. Pletner, Representation of solutions of the two-dimensional gravitational-gyroscopic wave equation by generalized Taylor and Laurent series, Zh. Vychisl. Mat. Mat. Fiz., 30(11) (1990), 1728-1740. Yu.D. Pletner, Representation of the solutions of two-dimensional analogues of the Sobolev equation by generalized Taylor and Laurent series, Comput. Math. Math. Phys., 32(1) (1992), 51-60. A. Rahimi, Frames and Their Generalizations in Hilbert and Banach Spaces, Lambert Academic Publishing. 2011. I. Singer, Bases in Banach spaces, v.2, Springer, 1981. I. Singer, Bases in Banach spaces, v. 1, Springer, 1970. A.P. Soldatov, Second-order elliptic systems in the half-plane, Izvestiya: Mathematics, 70(6) (2006), 161-192. A.P. Soldatov, A function theorety method in elliptic problems in the plane, II. The piecewise smooth case, Izvestiya Rossiiskoi Akademii Nauk. Seriya Matematicheskaya, 56(3) (1992), 566-604. A.P. Soldatov, A function theory method in boundary value problems in the plane, I. The smooth case, Izvestiya Rossiiskoi Akademii Nauk. Seriya Matematicheskaya, 55(5) (1991), 1070-1100.
erential Equations, 26(1) (1990), 116-120.
erential Equations, 25(1) (1989), 109-115. A.G. Sveshnikov, A.B. Al'shin, M.O. Korpusov, and Yu.D. Pletner, Linear and nonlinear equations of Sobolev type, Fizmatlit, Moscow, 2007. I.N. Vekua, New methods of solution of elliptic equations, Moscow, Gostekhizdat, 1948. I.N. Vekua, Generalized Analytic Functions, Moscow, Fizmatqiz, 1959. R.M. Young, An Introduction to Nonharmonic Fourier series, Springer, 1980.